Pre-Owned, 1934 Vintage Rolex Bubbleback, 14K rose gold case with cream dial, 2, 4, 6, 8, 10, 12 Arabic numerals and hour markers, fixed rose gold bezel, plexiglass, gold plated pin buckle with brown leather strap (both not by Rolex). 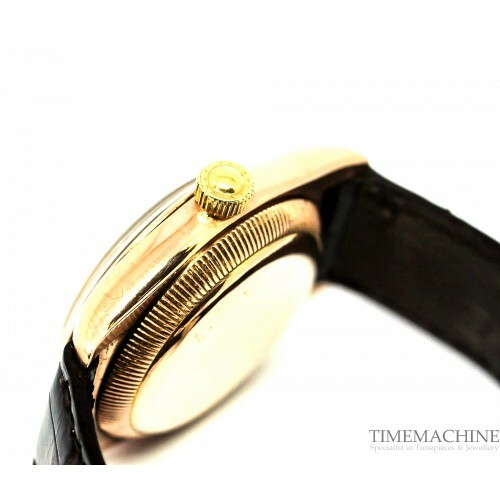 34mm, manual winding, red gold bezel. TM Certificate, TM Box with a 12-month TM mechanical guarantee. 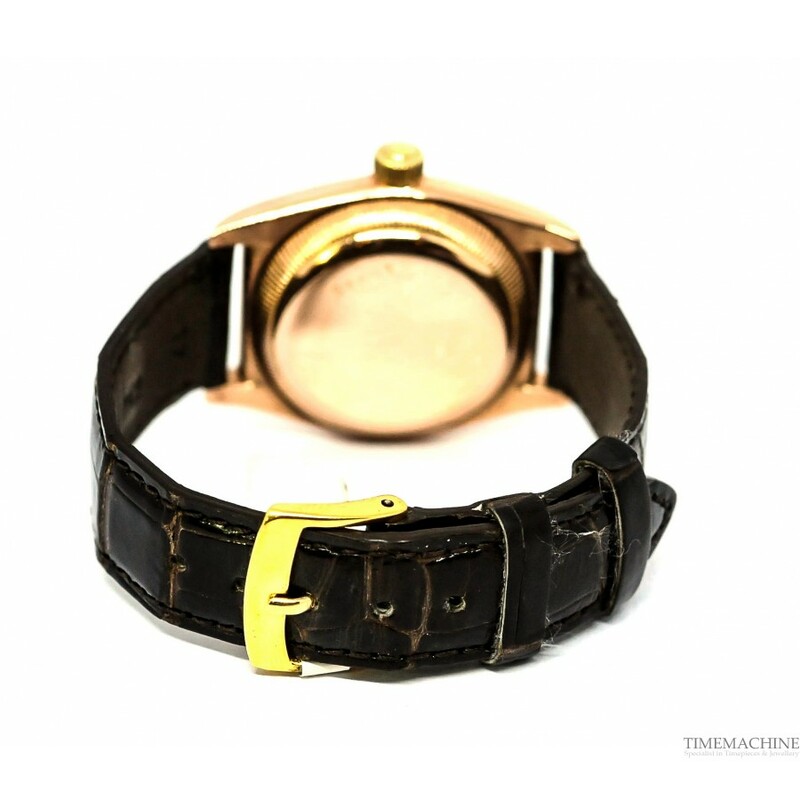 Please quote 4162 in all communications with us regarding this Timepiece. One of the unique Rolex watches is the Rolex Bubbleback, whose name comes from its protruding case back, which bulges in order to accommodate the thick movement and rotor that turns on a pivot, powering the winding of the mainspring. 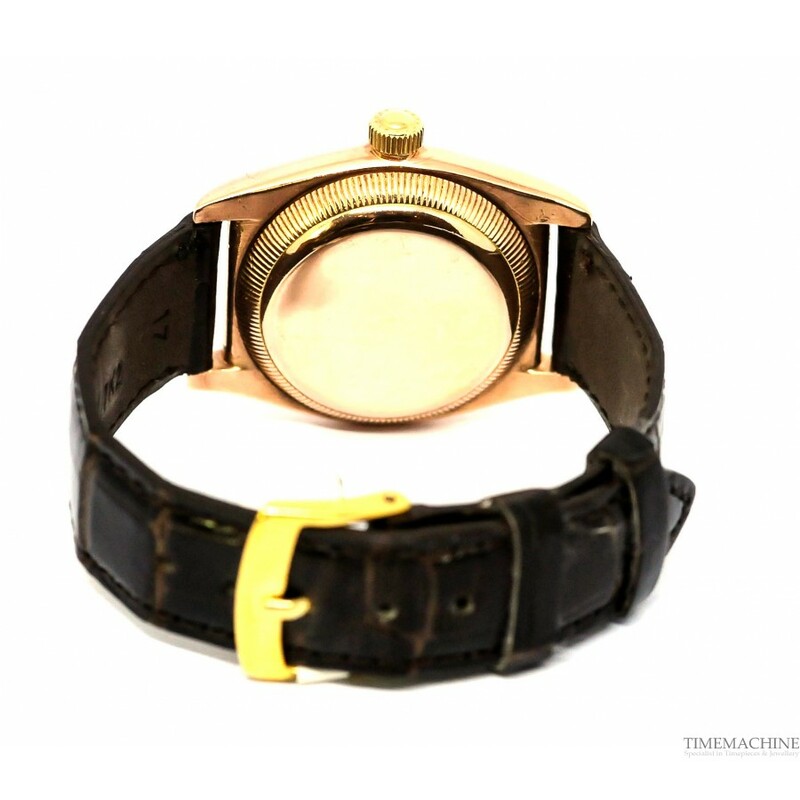 The first Bubbleback made its appearance in 1933, and the watches were produced for only about twenty years. 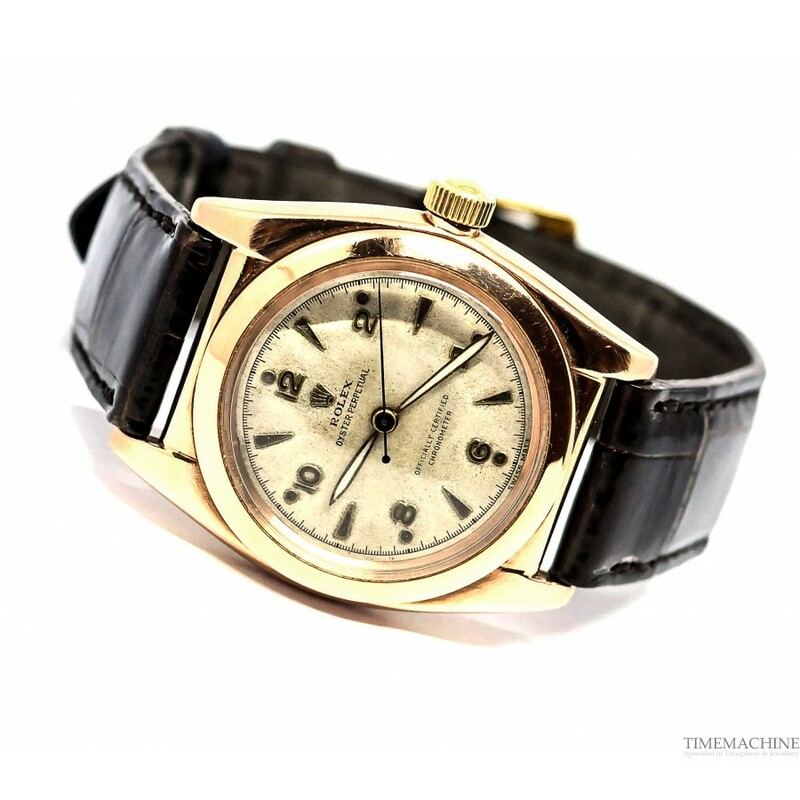 The Bubbleback helped establish Rolex as a brand known for its reliability, and these watches certainly are reliable—as evidenced by the relatively high number still functioning today. Most of the early Bubblebacks displayed time only. The original model featured subsidiary seconds, which later changed to sweeping seconds. 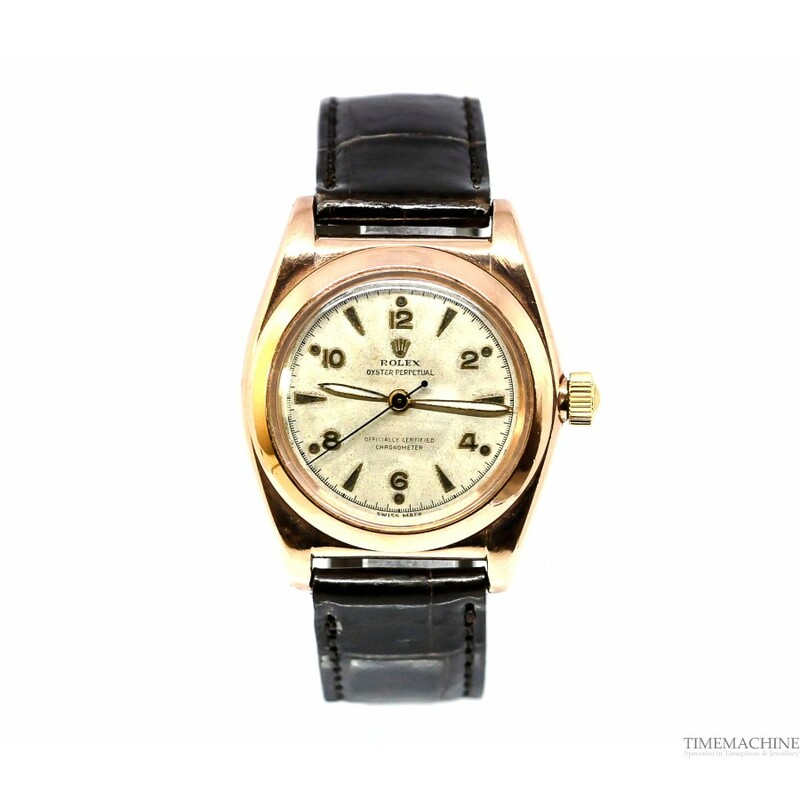 Later models also included the date, becoming the first DateJust models produced by Rolex. In 1935, Rolex developed the “Super Balance,” a streamlined balance wheel that improved the functioning of the Auto-Rotor. Rolex then began producing the watch in three different sizes to make it more appealing to individuals of both genders. 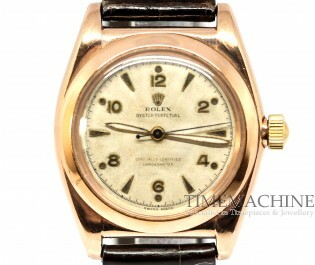 In 1941, Rolex launched a Bubbleback model intended specifically for ladies. Most popular versions of the Bubbleback are Steelium (stainless steel), Rolesor (half gold, half steel) and gold (9k, 14k, 18k pink or yellow gold). 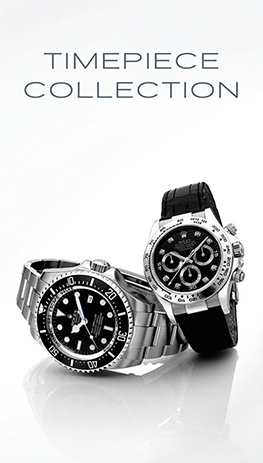 The terms Steelium and Rolesor are unique creations of Rolex, who patented them in 1931 and 1933 respectively. Case style variations include engine-turned and smooth bezels as well as some with hooded lugs. More variation can be seen in the dial designs, which differ between black, pink, or white dials, two-tone dials, 24-hour military-style dials, and an atypical California dial with mixed Roman & Arabic numerals. 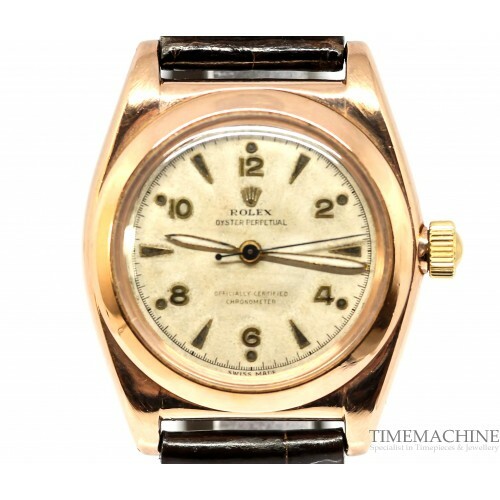 The Rolex Bubbleback is a very iconic watch and a coveted collector’s piece.